Find a Train & Rail trip that explores Switzerland. There are 5 tours to choose from, that range in length from 8 days up to 14 days. The most popular month for these tours is May, which has the most tour departures. "We think the tour of Switzerland using the train system is the best way to see the..."
Enjoy a panoramic journey across the Swiss Alps, with amazing views of icy glaciers, remote forests, majestic mountains, shimmering lakes and idyllic Alpine villages. Travel along the GoldenPass Line, linking two of the country’s most contrasting regions and connecting the age old traditions of Central Switzerland with Lake Geneva. Hop onboard The Chocolate Train to indulge in delicious chocolate at Maison Cailler. 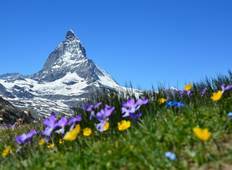 Visit the mountain resort of Zermatt and ride the open-air railway, the highest in Europe, to Gornergrat. Experience the luxurious surrounds of a First Class car onboard the Glacier Express. Marvel at the ingenious skill of Swiss engineers as the train smoothly navigates steep gradients, making your way through numerous bridges and tunnels. Enjoy a ride on the Bernina Express, offering excellent views of valleys and mountains and see if you can spot glaciers on the horizon. Discover the white wonderland of St. Moritz, Switzerland’s premier resort town and enjoy magnificent views of the Rhine Gorge. Arrive at least 30 minutes before departure as Zurich station can be quite crowded. Give yourself sufficient time to find the train and get settled once boarding. Consider travelling in spring as it offers the perfect setting with lush green valleys and snowy mountains. 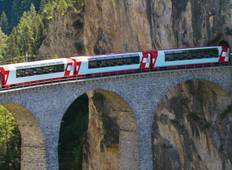 The Glacier Express does not run for a few weeks between October and December. Check with your tour operator for the exact dates. You’ll be served drinks, snacks and an à la carte menu for meals. Luggage can be stowed below or above the seats or on the rack at the end of the coach. Avoid placing your luggage on the adjoining seat, even if the coach is not full. The entire journey takes approximately seven and a half hours and covers 257 km. First class offers fewer seats per coach and more leg room. Smoking is prohibited on the train.